I was a couple of years late into the game trying Santal Massoïa Jean-Claude Ellena (created for the Hermèssence collection). Perhaps it was after the Iris Ukioye that I felt a little disappointed in the line. I feel that the majority of the new creations are becoming victim of their own style. As if the creator's commitment to stick to a certain genre of aesthetic statement. I feel that no matter what theme would be picked for this line, and no matter how outrageously intriguing the combination of notes may be, the result would be the same ethereal, non-descript quality of non perfume. Something quite pleasant, utterly wearable and easily so. 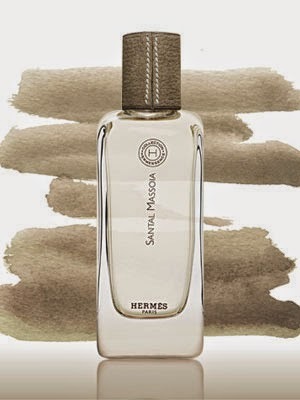 Like many of the scents in the collection, in the several times I wear it and try to find words to describe it - I stick my nose really close to my wrist and shake my head from side to side in search for something more. And before it has any chance to appear, the scent disappears altogether. Which is truly unfortunate in the case of Santal Massoïa. I was truly excited to discover what Jean-Claude Ellena would do with such an intriguing raw material as massoia bark: a rarity in the world of naturals, offering an extremely milky, lactonic odour reminiscent of toasted coconut and melted butter. It would have been the perfect accompaniment to sandalwood - highlighting its milky, creamy qualities, especially the Mysore kind which is practically non existent. This would have helped, I thought, to create a similar quality even in lesser varieties from, say, Australia or New Caledonia. Instead, I get a watered-down, vaguely woody rendition with hints of peppery spice - sort of a cross between Iris Ukioye, somewhat violetty tea-like hints like Osmnathe Yunnan, and a very subtle wink towards Poivre Samarcande (but with non of the piquant originality of the latter). The sandalwoodiness of it is practically a reflection of a reflection of a clear water pool in a mirror; and the milkiness is more reminiscent of cold milk that one would gulp to wash down a very dry and neutral flavoured shortbread. Maybe if this appeared before any of the above scents did, it would seem original. But being the tenth fragrance in the collection, I desire for something more, something original and surprising. Which haven't happened since the launch of Vanille Galante, and only happened again with Épice Marine (the 11th in the series). This is very thin and linear, which is unfortunate, because neither sandalwood nor massoia are. It left me lukewarm and wanting much more. What a coincidence -- I was just looking at this fragrance on the weekend, wondering what it would be like. Thank you for your honest impressions -- I also hoped it would be amazing. Perhaps it feels flimsy because massoia is somewhat restricted in Europe for use in mainstream perfume? I wish it were amazing... I don't think they are using real massoia. It is IFRA banned AFAIK. But whatever substitutes they are using don't even come close to the buttery, coconutty characteristics of this exotic bark. With that being said, I would be happy to experiment with this kind of combo in my lab. I think I know what I'll be doing today !